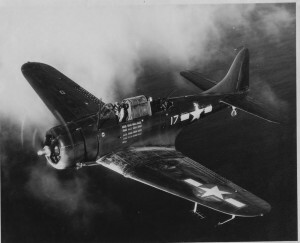 On the night of December 9, 1943, an SBD-5 Dauntless aircraft, ( Bu. No. 28767), struck an unoccupied truck that was left parked along the side of the runway during take off. The aircraft was damaged beyond repair, but the pilot and the gunner were unhurt.